Amid the highly charged debate surrounding the health-care bill that the U.S. House of Representatives will vote on later this week, one much smaller event on the health-care front seems to have been largely overlooked by the public. As a Kaiser Health News article published earlier this month notes, two Democratic members of the House and a prominent hospital president met with both President Donald Trump and Health and Human Services Secretary Tom Price to discuss ways to lower prescription drug prices. The two House members, Reps. Elijah Cummings of Maryland and Peter Welch of Vermont, made the case for a bill that would give the federal government more power to negotiate prescription drug prices. This meeting came the day after Trump wrote on Twitter that he was “working on a new system where there will be competition in the Drug Industry. Pricing for the American people will come way down!” Both Cummings and Welch said that Trump seemed generally supportive, and agreed to review the proposed bill, which Cummings said at the time he hoped to introduce to the House in about two weeks. So why are drug prices so high in the United States? As an article published last August in the journal JAMA notes, Americans spent an average of $858 on prescription drugs in 2013, compared with an average of $400 in 19 other highly developed countries — due largely to higher prices, not just consumption of more drugs. 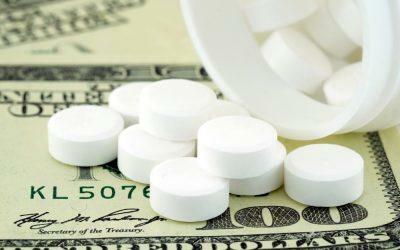 The article goes on to conclude that several factors keep drug prices in the United States high. As described in a summary of the JAMA article published in Time magazine, these include the fact that the U.S. government doesn’t negotiate drug prices, as happens in most other rich countries. Under the 2003 Republican-backed law creating the Medicare prescription drug program, negotiating prices with drug companies isn’t allowed. Other factors mentioned in the analysis include too-generous patent protections for drug companies, slow approval of generic drugs, and state regulations that often make it hard for pharmacists to substitute generic drugs. The authors note that while drug companies often claim that price controls would hurt their ability to invest in new drugs and treatments, they actually spend only about 10% to 20% of their revenue on research and development. In fact, most research that leads to new drugs is funded by U.S. taxpayers, through grants given by the National Institutes of Health to academic researchers. What’s your take on drug prices — have you struggled to afford prescription drugs, or are you more or less happy with what you pay? Should Congress allow Medicare to negotiate prices with drug companies? Do you think President Trump will pressure Congress to do this? Should the government set rules to encourage wider use of generic drugs to lower prices, even if this means many insurance plans end up not covering brand-name original drugs? Leave a comment below!